This tour allows you to view the Inti Raymi ceremony from the mountain above without the need to purchase entrance tickets. The tour will start from Cusco and after a 1hr hike, you will get to the top of the mountain where you will be able to see the Inti Raymi ceremony. Check-in from 09:30am to 09:45am at Plazoleta Santa Teresa (5 min walk from Main Plaza). There will be a check-in table. The INTI RAYMI from mountain hike is challenging. You will hike 1hr to 1 1/2 hrs to the summit of a mountain without a trail. Only physically fit adults between 18 - 45 years of age are allowed. Our friendly staff will wait for you between 09:30am and 09:45am at Plazoleta Santa Teresa, where you will register at the check-in table with your passport. Your tour guide will lead the group on a hike to reach the mountain summit. An assistant guide will follow behind the slowest hikers. Upon arrival to the mountain summit, your guide will position the group in locations where you can have a good view of the Inti Raymi below. The representation of the Inca is one of Pachacutec, which is the Inca in which the sun god (Inti) revealed his might and strength. The armies come from the four quarters of the Inca Empire and there are different ceremonies, dances, fires, and more. 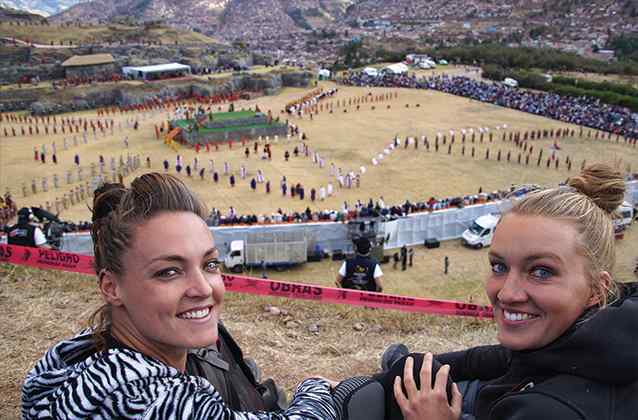 The ceremony lasts about 90 minutes and is in Quechua but visually is powerful. As soon as the ceremony ends, everyone will start heading down back to Cusco city center. Because there will be a lot of people, it will be very difficult for the guide to gather the group together. So everyone will return to Cusco city center on their own. If during the length of the tour, a traveler abandons the excursion due to altitude, health, or for any other reason, no reimbursement will be made and no claim accepted.